[Review] Elizavecca Milky Piggy 24K Gold KANGSI Pack | The Broke Asian. I've been a little slow catching up reading and writing posts since my brother is visiting from California this week, but I really wanted to squeeze in a super quick post to talk about the Elizavecca Milky Piggy 24K Gold KANGSI Pack. Elizavecca Gold Kangsi Pack contains 24K gold powder extract, berry extracts, green herb extracts, and hydrolyzed collagen that promotes smooth and radiant skin. While applying to the face, you will be surprised to find the shining golden pearl pearlescent pack turning into a white kangsi pack. Elizavecca Gold Kangsi pack can get rid of the aging cutin and sebum and dirt, absorb oil, supply the skin with water, and also help skin with excellent lifting and repairing efficacies, keep the skin tight, moisturized and brilliant. It leaves visible results just after one use! Water, Silica, Alcohol, Maltose, Glycerin, Polyvinyl, Cyclopentasiloxane, Polysorbate 60, Lavandula Angustifolia (Lavender) Extract, Rosmarinus Officinails (Rosemary) Extract, Origanum Vulgare Leafe/Flower/Stem Extract, Thymus Vulgaris (Thyme) Extract, Phyllanthus Emblica Fruit Extract, Aristotelia Chilensis Fruit Extract, Euterpe Oleracea Fruit Extract, Rubus Idaeus (Raspberry) Fruit Extract, Vaccinium Angustifolium (Blueberry) Fruit Extract, Vaccinium Myrtillus Fruit Extract, Vaccinium Macrocarpon (Cranberry) Fruit Extract, Propolis Extract, Glycyrrhiza Glabra (Licorice) Root Extract, Portulaca Oleracea Extract, Hydrolyzed Collagen, Adenosine, Ceramide 3, Gold, Synthetic Fluorphlogopite, Tin Oxide, Titanium Dioxide, Iron Oxides, Carbomer, Tromethamine, Fragrance. After cleansing, evenly apply on your face. Leave on for 20 minutes, or until all the gold color has changed. Rinse with warm water and follow with regular routine. It comes out of the tube gold, but as it dries, it turns into a white/grey color. 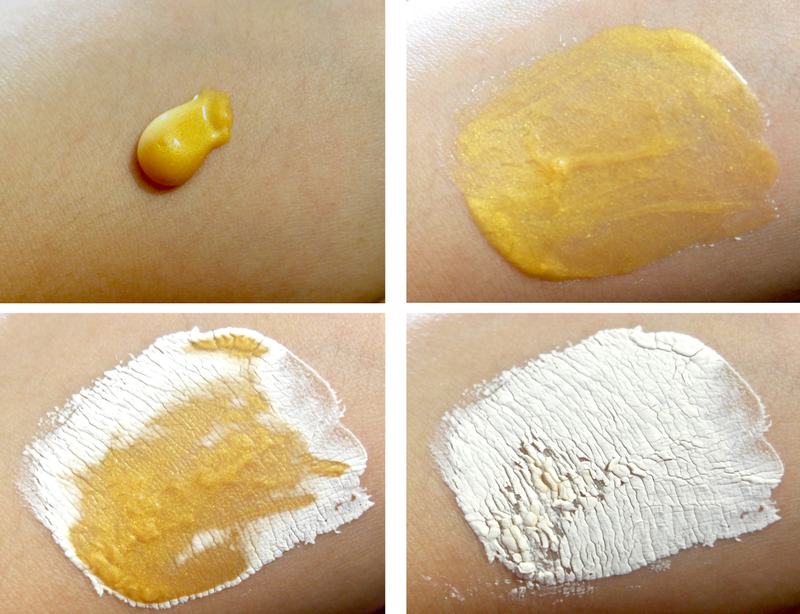 The consistency ended up being much more thin than I anticipated, and it sort of just melted/gilded on my skin when applying. Because of that, the color isn't super gold on your face and the actual mask starts to dry pretty quickly. As you can see, my pores and scars are still visible through the thin layer. It doesn't look like it's a lot of product until you see it drying. What I really like about this particular mask is how nicely it washes off. Once you splash water on it, it kind of just dissolves off your skin. The gold shows better on my hand vs on my face. Since the consistency of this was very thin during application, I didn't expect it to dry out like other clay masks. However, it dried very quickly and similar to regular clay masks meant for acne or large pores. It's also easy to see if it's dried completely and ready to wash off just by seeing if there's any gold areas left. Like I stated before, it washes off easily with water, causing it to just melt off your face with ease. I was surprised how soft my skin felt after using this. 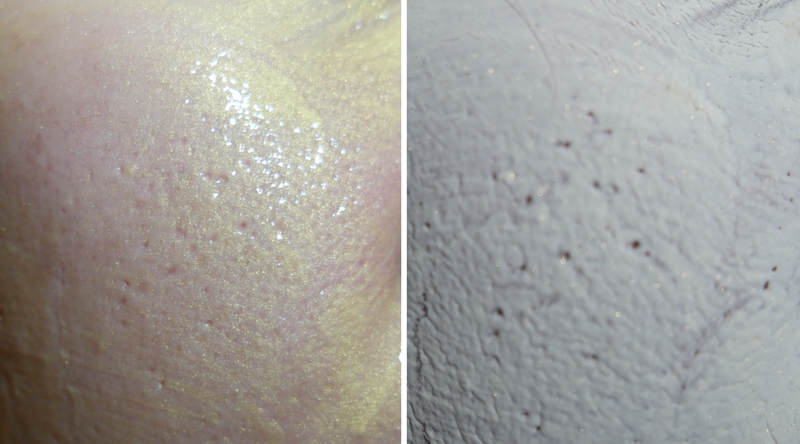 Other than being soft, there wasn't any other immediate results (such as pore minimizing or brightening). I doubt I would repurchase as there are other masks I'd like to try eventually, but I will definitely be using all this up...which I can't say for a lot of my purchased products. Also, I've been eyeing the Elizavecca Milky Piggy Carbonated Bubble Mask for a while now, but someone had told me it wasn't worth it. Have you used it? Let me know, I'm still debating on it!